Ármin Vámbéry got in contact with the Academy before his first Eastern journey, as an enthusiastic participant of the reading sessions held at the second floor of the Trattner House. After returning home, he regularly held readings at the Academy.Between 1867 and 1899 he read 26 times his own treatises, and several other times the works of young researchers and scholars who were not members of the Academy. This is how the writings of the young Ignác Goldziher, Károly Pozdner, Gábor Bálint, József Thury were first heard in the new palace of the Academy. His presentations were most attended in the years of the “Ugro-Turkish war” in the palace along the Danube. From his election until his death he tried to serve the cause of the Academy in all respects, whether by personal work or by using his relationships. When an “expeditio” was launched to Istanbul to explore the Corvina codexes, brought there from the Buda castle of King Matthias Corvinus after the Ottoman conquest in 1541, they also needed a specialist of Oriental languages. Therefore, in the letter written to the Minister of Education, the Academy suggested to include in the academic committee composed by Arnold Ipolyi, Ferenc Toldy, Iván Télfy and Ferenc Pulszky also Ármin Vámbéry. 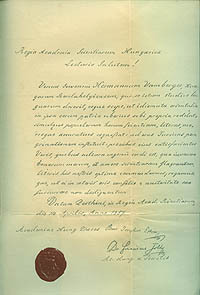 In 1889, when Vilmos Frakói read his “First report on the operation of the Constantinople Committee”, he proposed that the Academy vote to say thanks to the regular member Ármin Vámbéry, “who with the gravity of his prestige and tireless fervor was a major factor of the hitherto achieved and still expected success.” 3 In June of the same year Ferenc Pulszky presented the so-called Rannusius Codex, which was brought by Vámbéry from Constantinople, and deposed in the Library of the Academy as a gift from the Sultan. Vámbéry personally made a report for the Historical Committee on his research conducted in the Ottoman imperial state archives, which provided new knowledge on the conditions of the Ottoman rule in Hungary (1541-1686). His academic career was unbroken. On 9 October 1860 he was elected corresponding member. He held his inaugural speech entitled On the Turkish historical literature on 29 April and 6 May 1861. 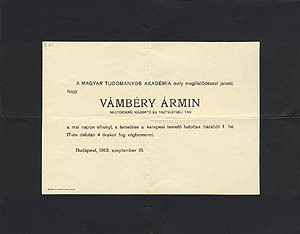 In 1876 – after an unusually long time – the 1st Class of the Academy appointed Ármin Vámbéry a regular member, “who won a European fame with his works”. He was elected with 28 against 11 votes. He held his inaugural speech on 15 January 1877 with the title On the etymological dictionary of the Turco-Tatar languages. In 1893 he was awarded the honorary membership without negative vote, and in the next year he was elected between the members of the board of directors. Nominated by the Academy, he was a regular member of the international Orientalist congresses. 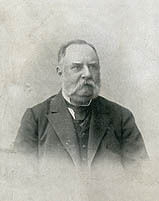 On the meeting of Florence (1878) he prepared the report for the Academy. Among the standing committees of the Academy, he was a member from 1868 until his death of the Linguistic Committee. He presented several recommendation of memberships. 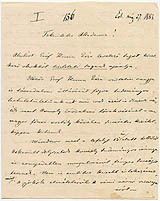 He recommended Count Géza Kuun 4 for honorary member, Károly Pozder for corresponding member, the English playwright Henry A. Jones, who studied Hungarian folk tales and legends, and the Turkish Minister of Public Education Mehmed Tahir Munif Pasha (1830-1910), who “strongly supports our efforts around the Corvinas”, for external members. In the case of both the archaeologist-explorer Aurel Stein and the Iranologist Sándor Kégl he gave one of the required two recommendations. From the academic awards he received the Samuel Prize in 1869 with his treatise Word correspondences in the Hungarian and Turco-Tatar languages. The publication of his The first sources of Uyghur language was supported by the Academy with 700 forints. 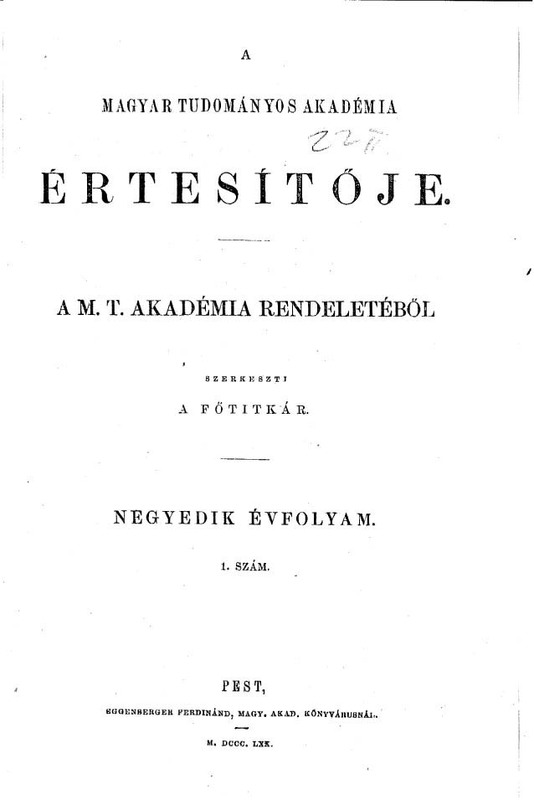 The second edition of his The origin of the Hungarians (1882) was published by the Publishing Committee of the Hungarian Academy of Sciences, just like his The Turkish race in ethnologic and ethnographic aspect (1885) and The culture of the West in the East (1906). On 17 September, the Academy participated in his memorial service. The 1st Class asked Ignác Goldziher to hold the speech of commemoration, who read it at the general meeting of 25 October 1915. 7 In this he did not evaluate in detail Vámbéry’s scientific achievements, 8 since this was already done by Bernát Munkácsi in the Budapesti Szemle, published on the commission of the Hungarian Academy of Sciences. Albert Berzeviczy, the President of the Academy remembered the 100th birthday of Ármin Vámbéry on the general meeting of 21 March 1932, 9 emphasizing that in Vámbéry we have to respect not only the founder of Oriental studies in Hungary, but also the excellent writer who was able to make them popular and beloved.